International Student Shipping – 200+ Countries Worldwide! Taking a year abroad? Going on a gap year? Studying internationally? Or just doing some travelling? If you’re travelling abroad, for whatever reason, My Baggage can help! 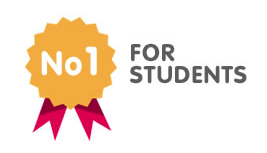 We provide quick, affordable international student shipping to over 200 countries worldwide. At My Baggage it is our mission to provide students with the most convenient and affordable luggage shipping option, so that you have one less thing to worry about as you travel abroad. 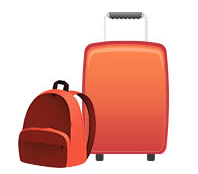 My Baggage provides an easier and cheaper alternative to airline baggage. We remove all the stress surrounding overseas luggage transport. No queuing at check in desks, waiting at baggage carousels or travelling with heavy bags. We offer a generous baggage weight allowance of up to 30kg/66lbs, as well as door-to-door service and full online tracking. It takes just a few minutes to book online and after that – we’ll do the rest with no fuss and no hassle. Read more about how our luggage shipping compares to airline baggage here. We understand that no student wants to wait weeks for their luggage to arrive after sending it with a shipping company – so fast delivery times are a top priority! For that reason, most of our international shipments arrive withing 3-5 days and we also offer express baggage delivery on items sent worldwide. So, you can have your items delivered internationally within 1-2 days, depending on your route. You will receive £/$100 free compensation cover with every item you send with My Baggage. You can increase this amount up to £/$1,000 during booking, for a small additional fee, if you wish. Before booking your compensation cover, we recommend taking a look at our list of prohibited and non-compensation items to ensure your items are protected. If you’re booking a luggage shipment outside the EU, you will need to complete customs forms. We will send you these forms once you’ve completed your booking. If you need any help filling in your customs forms, let us know and we’ll be happy to help. 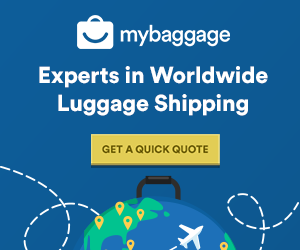 My Baggage provides worldwide luggage shipping to over 200 countries, including France, Germany, Italy, Australia, USA and Canada to name a few of our top locations. Below are just some of the popular destinations we ship to. Visit our quote page to view the full list of countries. So, if you’re coming from Australia, China, North America or closer and are a European student, we’d be more than happy to help you. Our service is provided to all of the towns and cities in all the countries we ship to. My Baggage is easy to book, quick and convenient. But the best thing about our luggage shipping service is the great low cost! Sending luggage internationally with My Baggage is cheap. It costs from as little as £16.99 within UK or $90 within USA to send a 30kg/66lbs item. You can get a quote any time on our homepage. And – we’re so confident in our great low prices, that we offer a handy Price Match tool. So, if you do happen to find a cheaper price elsewhere, let us know and we’ll try out best to beat it! Need to send luggage abroad? Get a quick quote now! Check out our international student scholarship!